so... massive thumb up, because quality is high. keep going... good job guys ! The interface is quite nice, the music could be better. rulez added on the 2006-05-28 14:26:39 by chenmy! Wooow ... awesome musaxxs !!! I really like the visuals and the overall feeling ... one word : stylish ! and opening music was good. plus za wykonanie, szczegolnie graficzne. muzyka dobra, ale wykonanie nie rzuca na kolana. zastanawiam sie po co robic covery i tak wielokrotnie juz rearanzowanych utworow. ogolem produkcja na plus. gratuluje. this is the way musicdisk interfaces should be done. damn excellent graphics, well useable, minimise to systray, etc. the music could be abit better though, esp sound quality wise. ups for including haddaway. 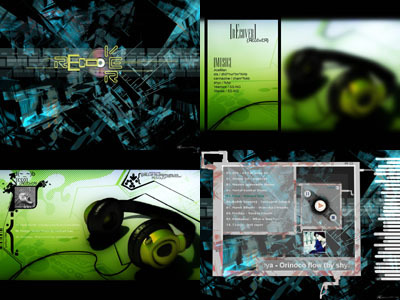 Fantastic gfx design, some nice tunes. The requested URL /prods/ReCover.zip was not found on this server.